Additive manufacturing (AM) technologies have resulted in significant changes to the way we design by enabling early prototyping of complex components. But the uptake of these new production methods beyond prototyping and small scale production remains slow. Part of the problem, contends Dr James Moultrie, Head of the IfM’s Design Management Group, is that industrial designers don’t have the know-how to make the most of these new technologies for series production of components. AM has the potential to transform not just the way things are made but every aspect of how firms go about meeting their customers’ needs, whether through customisation, supply chain reconfiguration or wholesale business model innovation. But if AM is to move beyond prototyping and small-scale production and become mainstream, industrial designers need to embrace its possibilities. As part of a recent research project, we surveyed 110 product and industrial designers and design engineers from 25 countries. While 72% of respondents often or routinely use AM for prototyping and just under half said that they ‘sometimes, often or routinely’ use it for producing tools, more than 60% said they had never designed end-use components for production with AM. The survey respondents said that they would choose additive over conventional manufacturing processes when they were dealing with low volumes, complex shapes, shape manufacturability and customisation. The main reasons given for not choosing AM were perceptions around cost and speed, concerns over repeatability and dimensional precision and over the material properties of components. "More than 60% of industrial designers have never used additive manufacturing for series production." Designers also noted that there is a lack of information to support design decision making. The information that exists focuses on ‘printability’ but printability in itself does not guarantee parts which are cost-effective when produced in volume. Whenever a designer designs a new component, they do so with an understanding of the limitations and requirements of the production process which they will be using. An injection-moulded part must have constant wall thickness, webs to support raised features and smooth transitions between surfaces. These ‘rules’ and principles are well established and are readily available in textbooks and online sources. The same is true for the majority of production processes. But where do designers look for information on how to design parts to take advantage of AM for series production? The hype says that ‘anything can be produced’ and that ‘complexity is free’. Designers are suddenly freed from the shackles and constraints of conventional processes. But is this true? Does AM provide limitless possibilities, or are there rules which can be applied to help designers make effective design decisions? To be able to exploit AM capabilities for series production, designers, engineers and manufacturers need to understand how its processes differ from other manufacturing processes and how they can be best deployed. This means, in effect, going back to the drawing board – totally rethinking the concept of design for products made using AM. We have been working with industrial partners to develop a set of design guidelines that will help accelerate the uptake of AM as an economically viable production process and also help designers understand how they can take advantage of the capabilities of AM technologies. 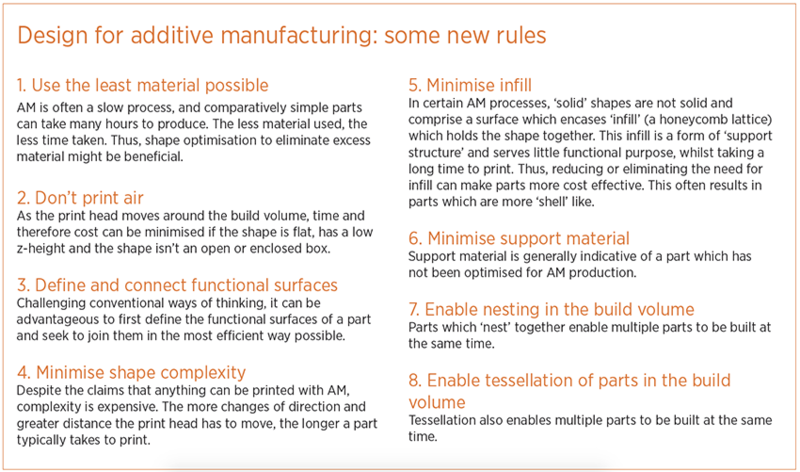 As a result, we have begun to codify some design principles, which aim to help designers design components which take better advantage of AM for series production. Rules for design for manufacture for conventional processes are well established. 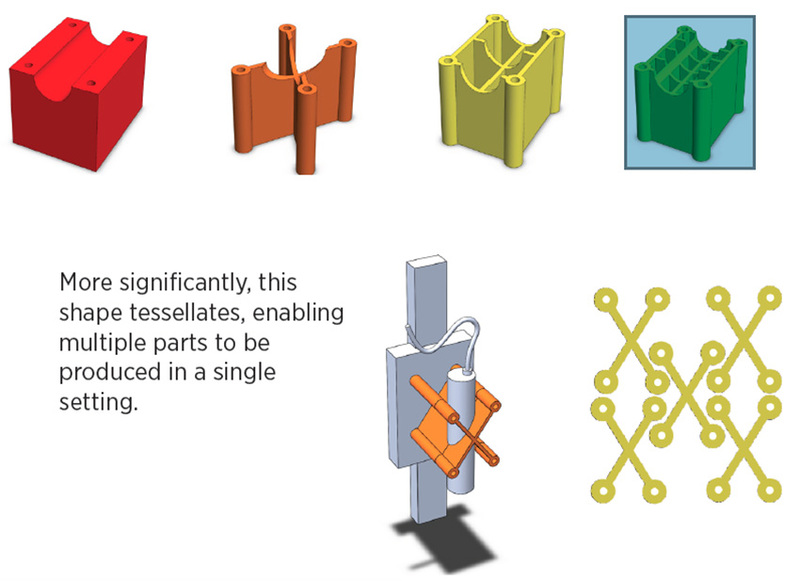 AM requires new ways of thinking, especially if designers are to progress from designing parts which are ‘printable’ towards parts which genuinely take advantage of AM as a production process. This is at an early stage, and may explain why take-up of AM as a series production process among the industrial design community has been limited to date. It is our hope that AM might begin to be more routinely considered as a manufacturing choice for series production by industrial and product designers. The graphic (left) is of a simple device for holding a sensor on a machine. The two red components are designed as you might imagine they could be for machining. They are ‘printable’, but they do not take good advantage of AM as a production process. We tried a range of alternative designs (below), to see how they influenced the build time and cost. The results showed that the most effective solution can save a significant amount of time and therefore cost, in a single build. This research project has been carried out in collaboration with Loughborough University and was funded by the EPSRC. This course covers the IfM’s proven approach to improving product design to make production line assembly as easy as possible – dramatically increasing the number of units you can make and the speed with which you can make them. Bespoke courses delivered using this approach have resulted in assembly times being cut by more than half and generated significant increases in productivity. Good design can greatly simplify the process of manufacturing a product, resulting in significant reductions in cost and assembly time. We can help by running hands-on, in-house workshops with your design and engineering teams. These typically last two days, during which time we review your product design and assembly processes and identify areas for improvement.